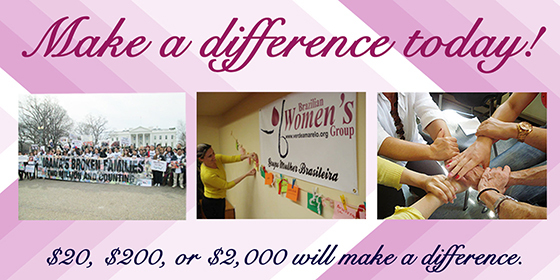 - Make a difference today! 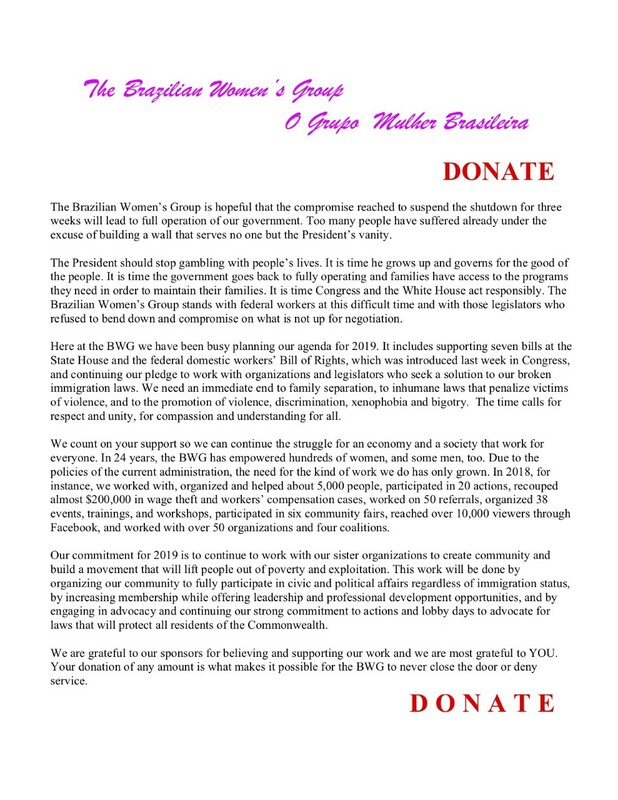 BWG statement on the shutdown and its 2019 agenda. Read more. 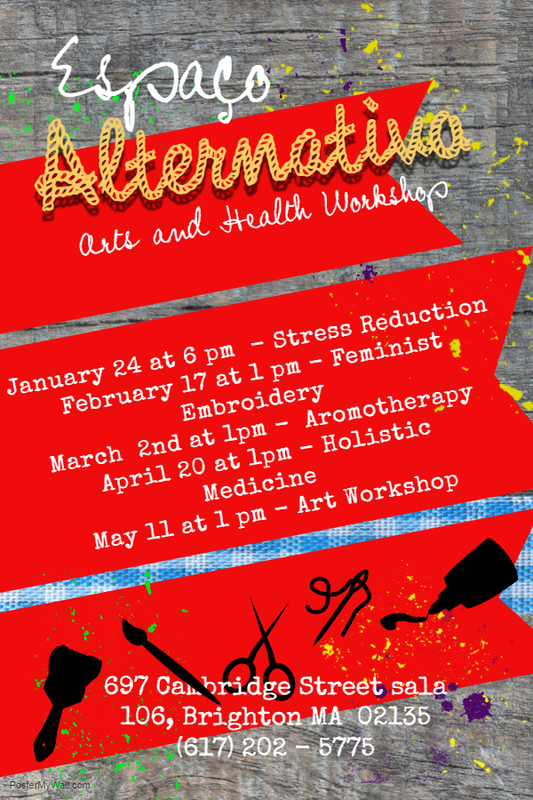 Monthly gatherings that work on alternative activities aimed at alleviating our daily tensions. Call 617-202-5775 to reserve your spot. Space is limited. See full calendar of events. With Attorney Hannah Krispin on family/domestic relations issues and immigration. Sponsored by the Brazilian Women's Group and Massachusetts Alliance of Portuguese Speakers & MAPS. By appointment only, please call 617-202-5775. See flyer. “Hyperwomen” (As Hiper Mulheres, 2012), An important female ritual approaches and a woman Indian rehearses the songs and dances. 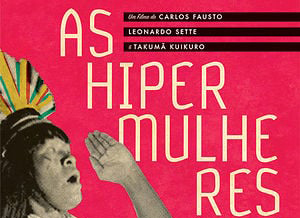 Directed by Takuma Kuikuro, Leonardo Sette e Carlos Fausto. The III Mostra Digaaí screens Brazilian Films every first Friday of the month, but for January, to promote debates aimed at generating an awareness about the different identities that exist in Boston. This event is organized by the Brazilian Women’s Group, Espaço Digaaí with the support of the Consulate of Brazil in Boston, and presented by curator Allan Oliveira. Free and open to the public. Spoken in Portuguese with captions in English. 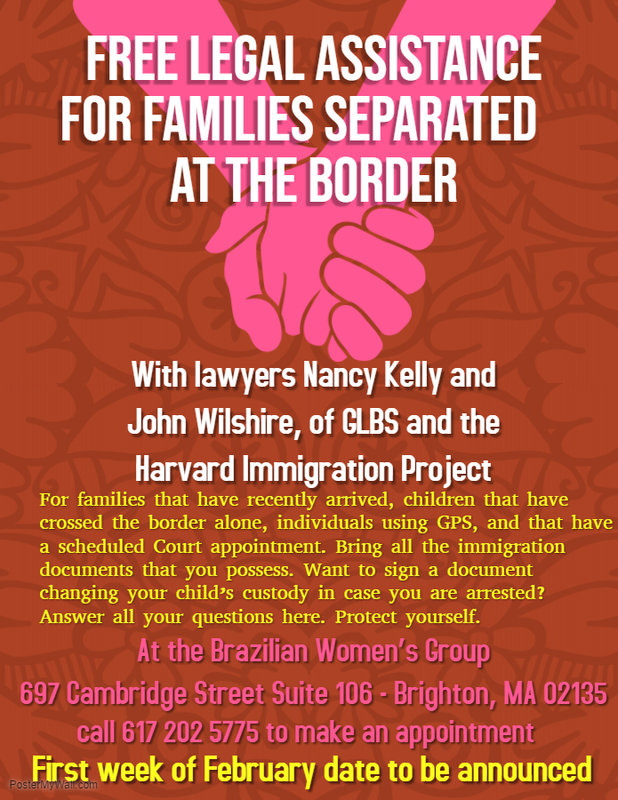 Join the Brazilian Women’s Group in advocating for driver’s license for all Massachusetts residents, for no collaboration between the police and immigration rights, for enforcement of labor laws, and other just bills. We need your support. See flyer. 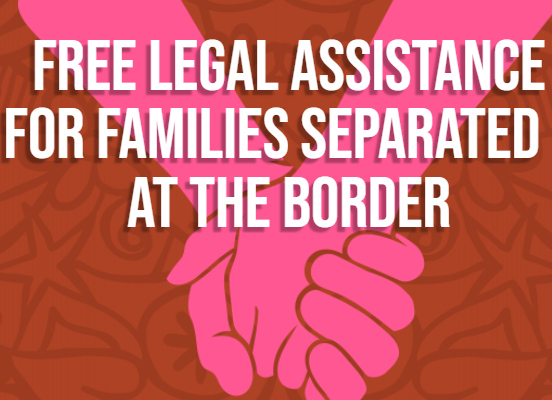 For mothers who have been separated from their children, newly arrived families, for families of children who crossed the border alone, individuals arrested by ICE and those being monitored by immigration. With attorneys Nancy Kelly and John Willshire, from GBLS and the Harvard Immigration Project. Bring all documents related to the case. 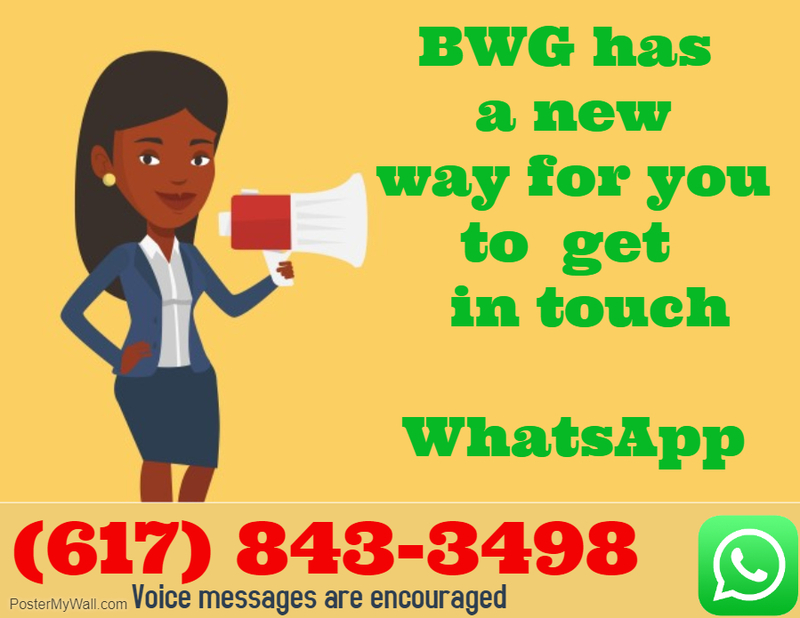 For information call BWG at 617-202-5775 or send us a message on WhatsApp to 617-843-3498. See flyer. 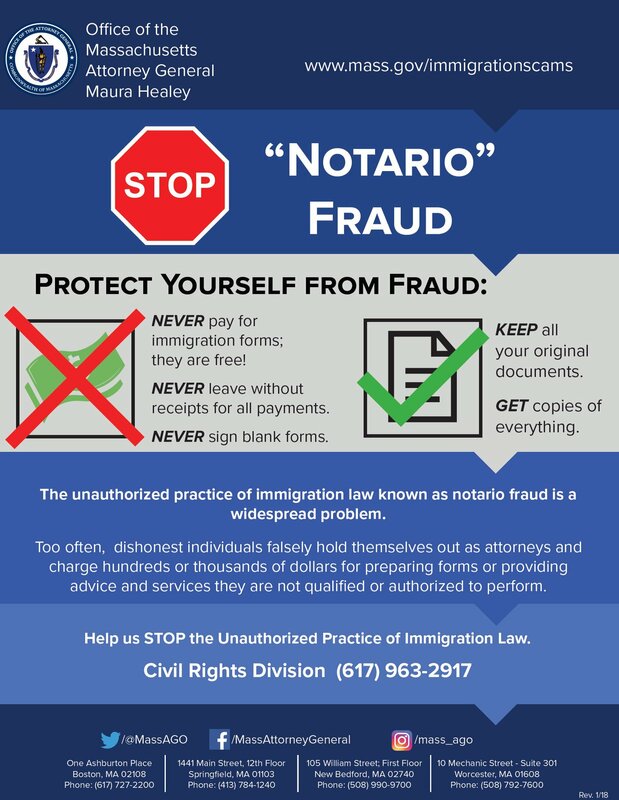 The Massachusetts Attorney General’s office published important documents: Guide for Families Impacted by Federal Immigration Policies, Emergency Planning Guide for Parents with Uncertain Immigration Status, and Avoiding Immigration Scams. Get Informed! 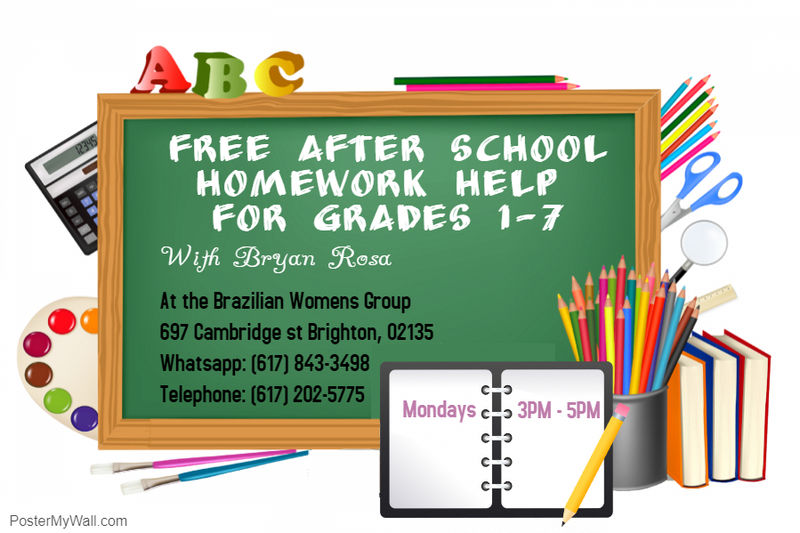 At Brazilian Women's Group - 697 Cambridge St. #106, Brighton Mondays 3-5 pm for grades 1-7 with Bryan Rosa. Call 617-202-5775 or send a message on WhatsApp to 617-843-3498 to make an appointment. See flyer. Are you qualified to become an American citizen? Do you want or need help to fill out the naturalization forms and to study for the test? 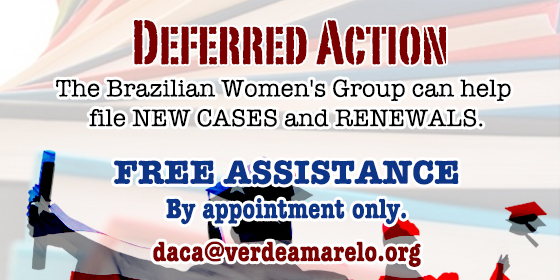 Talk to us: cidadania@verdeamarelo.org or call 617-202-5775. 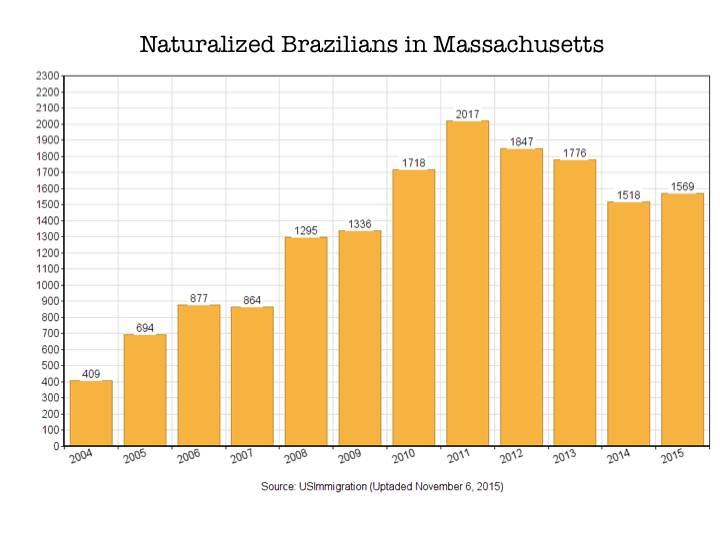 Do you know that Brazilians are the second largest group in naturalization ceremonies? Make a difference! Become an American citizen! See chart. ESL classes are held every Tuesday at 6 pm and at 7:30 pm. Are you an American citizen and not registered to vote? We can help. We have forms in English and Portuguese. Walk-in. It doesn't take more than 5 minutes. You can also register to vote online. Join us! 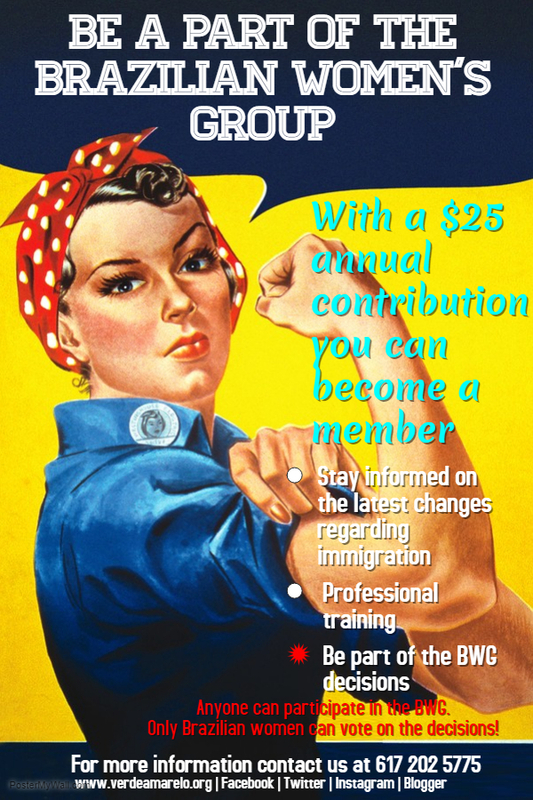 Your participation helps make us a stronger organization in advocating for the rights of immigrants, and helps us better serve the needs of our community. You will also receive information and invitations to participate in events, trainings, campaigns and more! See flyer. More information. 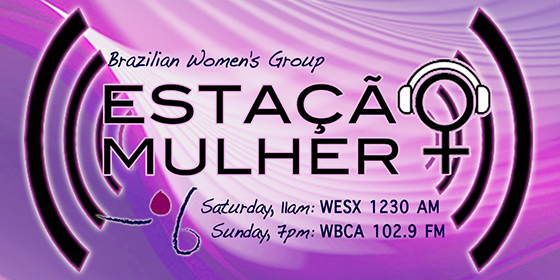 Estação Mulher, the Brazilian Women’s Group radio show. Every Saturday, 11-12 PM at WESX 1230 AM. Interviews, opinion, ideas, an open dialogue with our community. Be a part of Estação Mulher! Call in to participate live (617-884-1230) Tune in or listen on line at http://realmediagroups.com. Click here to listen to past radio shows. 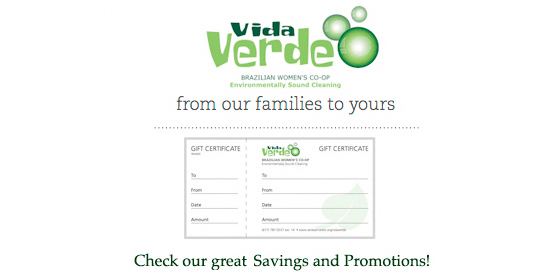 The Brazilian Women's Group is a proud member of the Massachusetts Coalition of Domestic Workers (MCDW). Please join us and the Coalition's workers' council to empower and organize domestic workers, implement the Domestic Workers Bill of Rights, and educate helpers and employers about this important law. 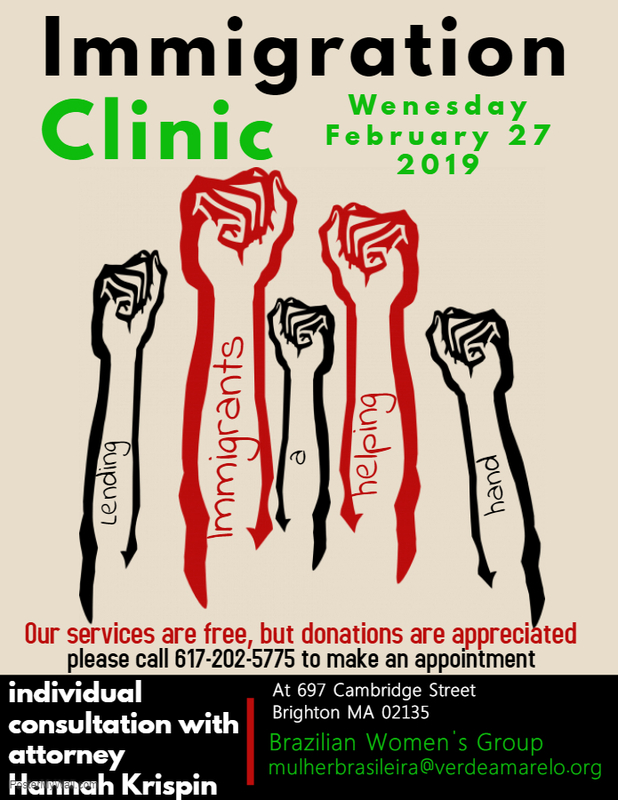 For more information email lydia@verdeamarelo.org or call 617-202-5775. Like us on Facebook. Are you looking for work? Read about many jobs listings here.